i love your card, so cute! Beautiful family! Got yours in a mail, and you will get ours a belated Christmas card and letter (just mailed it out today) Sorry, but you will love it. Your sure have a gorgeous family. Merry Christmas. 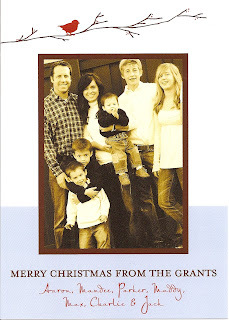 This is a darling card and a beautiful family. Your little boys are so adorable. you and your hubby are obviously made for each other. you look hot as ever! can't wait to see you at the end of the month! Cute family! Your kids are getting so old! I LOVE your Christmas card and your little update. A very Merry Christmas to your family from ours!! I just want to say that you get more beautiful every year. How do you do it?